The Ebola outbreak in West Africa was one of the most significant events in recent memory. Ebola Fighters were even named Time Magazine’s Person of the Year. The virus quickly swept through Guinea, Liberia and Sierra Leone, devastating families and killing thousands, including much of the medical staff in these countries. Through medical care, prevention and education it has slowly been brought under control. 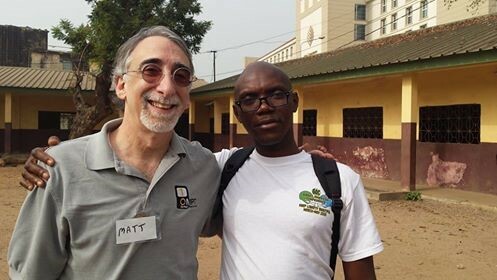 The U.S. Centers for Disease Control and Prevention (CDC) heard about OMPT’s training and technology and wanted to offer it to their partners in West Africa for use in community outreach and education. Sponsored by the CDC Foundation and hosted by the U.S. Embassy, OMPT facilitated a workshop in Conakry, Guinea in January of 2015. The training was led by Executive Director Matt York, accompanied by a bilingual member of Videomakers Without Borders, Gerard Ungerman. There were 37 participants from 20 organizations including UNICEF, Save the Children and the U.S. Peace Corps. OMPT brought 300lbs of equipment with them, including 100 projector kits and 100 recharge kits. The participants created videos to educate people about the virus and destigmatize those affected.